I will be running all the FIM services from one server so I need to have all the software listed for each service installed. Each server hosting the different FIM 2010 server-side components has a different software requirement. In this document, you will find the software requirements for each of the FIM 2010 server-side components. If you decide to install all the server-side components on one server, you must install the software requirements for each of the FIM 2010 server-side components on that server. Windows Installer 4.5, if you are running Windows Server 2008. It is already included in Windows Server 2008 R2. 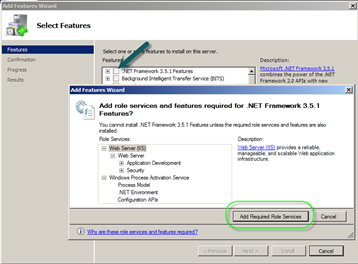 Microsoft .NET Framework 3.5 (Windows Server 2008) or .NET Framework 3.5.1 (Windows Server 2008 R2). 64-bit SQL Server 2008 Standard or Enterprise Editions, SP1 or later. This software is required only if you use the FIM Office add-in. Windows Installer 4.5 already included in Windows Server 2008 R2. Microsoft .NET Framework 3.5.1 (Windows Server 2008 R2). 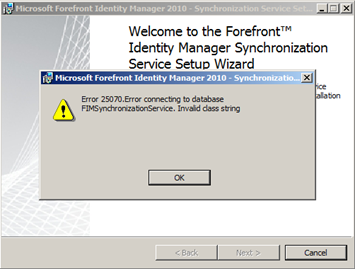 If you do not install this when you update FIM you may see this error: Error 25070. The download you want is mid-way down the page.